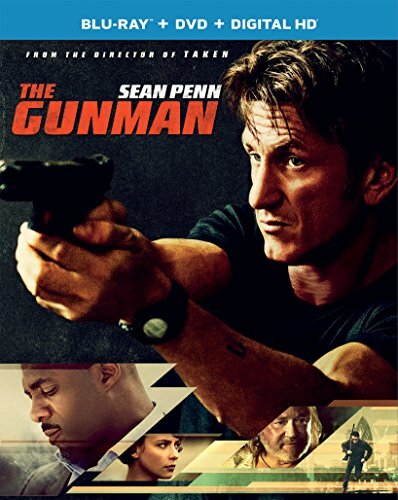 Universal City, California, April 28, 2015 - Two-time Academy Award(R) winner Sean Penn (Milk, Mystic River) is the object of a deadly international manhunt in the pulse-pounding thriller The Gunman , coming to Digital HD on June 16, 2015 and on Blu-ray(TM) Combo Pack and DVD as well as On Demand on June 30, 2015 from Universal Pictures Home Entertainment. The latest nail-biting adventure from director Pierre Morel (Taken), The Gunman is an electrifying combination of suspense, non-stop action and sheer star power that Steve Prokopy of Ain't It Cool News calls "Spectacular!" It has been eight years since Jim Terrier (Penn) worked as a black-ops assassin and now someone from his old organization wants him dead. Pursued across Africa and Europe by a team of elite hit men, Terrier is dragged back into his dangerous past as he engages in a relentless cat-and-mouse game to take out the man who betrayed him. Idris Elba (Prometheus, Mandela: Long Walk to Freedom), Ray Winstone (The Departed, Hugo), Mark Rylance ("Wolf Hall," Anonymous) and Oscar(R)-winner Javier Bardem (No Country for Old Men, Skyfall) costar in a hair-trigger thrill-ride critics are calling "Intense!" (Dave Karger, Fandango). Blu-ray(TM) unleashes the power of your HDTV and is the best way to watch movies at home, featuring 6X the picture resolution of DVD, exclusive extras and theater-quality surround sound. DIGITAL HD with UltraViolet(TM) lets fans watch movies anywhere on their favorite devices. Users can instantly stream or download.